1 Choose Lens Type ? Regular Lenses are the most common lenses installed by manufactures. They are found in most fashion sunglasses regardless of price. Our Regular Lenses provide 100% UV protection and meet or exceed all known government sunglass standards. They are durable and in many cases exceed the original manufactures lenses in terms of optical clarity and durability. If road glare or bright sunlight is an issue for you polarized lenses are the solution. They reflect unwanted glare away from yoru eyes reducing eye strain. Many customers suffering from migraines claim our polarized lenses help reduce their frequency. All our polarized lenses provide 100% UV protection and meet or exceed all known government sunglass standards. Poalrized lenes are far more complex to manufacture thus the higher price. Polarized lenses can be slightly less durable than a regular lenses. If no colour options show up when you select Polarized lenses this means we can not make polarized lenses for your model at this point in time. 2 Choose Lens Colour ? Lens colours shown are the only colours we can fit in the models. ** Please note, if there are two of the same colour lens in the same lens type it usually means we offer our higher end ultimate lenses as well as the polycarbonate version of the same colour lens. The Sunglass Fix requires your frames and at least one original lens to custom make or install lenses for your sunglasses. Customers outside of Australia Mail their frames in. We charge 7.95 to mail the frames back. There is an option to add tracking service at cost at checkout. Pick up and Delivery: We send you out a flat pack box and prepaid post back to our facility. This ensure your sunglasses are packed well and travel safetly to our facility. However, it does take longer as you have to wait for the pick up kit to arrive in the mail. You Mail In: You mail your sunglasses frames in and we mail them back to you registered post. It's a faster option but does require you to pack your sunglasses well. 4 Commonly Requested Repair Accessories ? Perfect for tighening hinges and installing lenes in metal framed sunglasses. The Sunglass Fix provides a case for free with your lens purchase. Screws are usually longer than required so they can be cut down to suit all applications usng wire cutters or a file. Trouble finding your sunglass model on our site to get replacement lenses? Is that model number on your sunglasses arm worn off? Just want us to do the installation of your replacement sunglasses lenses for you? You have found the right place. Just select the type of lenses and colour you would like in your sunglass frames, elect your shipping option, then leave the rest to The Sunglass Fix. Once your frames arrive we will make and install your frames. We also tighten your hinges and do a general clean up of your frames. Try our award winning lenses and experience why so many of our customers claim our lenses perform better than their originals lenses. We offer one of the best guarantees on the market and stand behind our products and services. 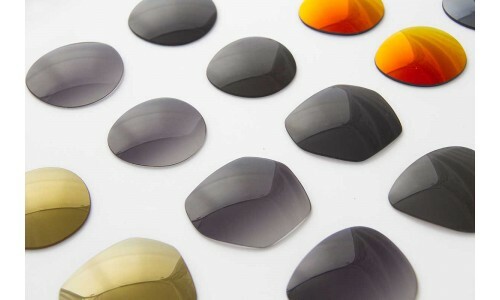 The Sunglass Fix manufactures and sources its own line of sunglass lenses. ** We professionally shape our lenses to fit almost any sunglass frame on the market. * We supply lenses for optometrist around the world as well as high end sunglass manufacturers. However, we take great pride in offering lenses directly to consumers like you so you can keep your sunglasses performing like new for years to come at a fraction of the price you originally paid. How Does Getting Custom Made Sunglass Lenses Work? We ask that customer place an order before sending in their frames. This way we know what you want, who to ship the completed sunglasses back to, and the process is not delayed waiting for payment. Ordering is simple, select lens type you want, the colour option, and the shipping option. Press order and check out. We will follow up within one business day with detailed shipping instructions. Most of the end to end time will be the postal transit time getting your sunglasses to and from our Lab. Normally, once we receive your sunglasses we make and install new sunglass lenses in 2 to 4 business days. This does depend on how many jobs we have in our queue. However, in the rare instance where it takes us over 5 business days we will contact you. For difficult jobs, such as rimless sunglasses, it may take us a little longer as the require significantly more time to design and create your lenses. We will send you an email once the job is complete letting you know that your rebuilt sunglasses are on their way home. For more information on shipping for custom made sunglasses please click here. Most sunglasses can be shipped from anywhere in the world to Australia for around $12 USD using 1st class air mail. We've been doing this for customers around the world for 8 years now and find it very safe and reliable. Within Australia expect to pay $7.45 depending on type of post you use or try our pick up and delivery service. We can not make single mask, goggle lenses where one lens covers both eyes. We require yoru frames. Making lenses from lenses seldom results in a proper fit as we have nothing to test against. Do not send just your lenses in as they will be returned at your cost. *We have no affiliation with the original manufactures. Most sunglass manufacturers do not offer replacement lenses or make it difficult and expensive to replace them. We just make our own line of great sunglass lenses so people like you can replace your lenses for as little as 5% of your original purchase price. Closest Match lenses are usually from the colours in the selection list. Please note that there are thousands of sunglass colours and mirroring options. We try to carry the most common and usually match them well but there may be slight differences in colours, tints, and mirroring from your originals. If you want an exact match you may be better visiting your optometrist or contacting the manufacturer for replacement lenses.